is it possible to assign all new item in a menu to a certain profile? When I add a new menu item I always have to go to template manager -> JA BLazes -> menu assignment and assign this new item to the corresponding menu. Is there a way to do this automatically for all new items created in the specific menu? 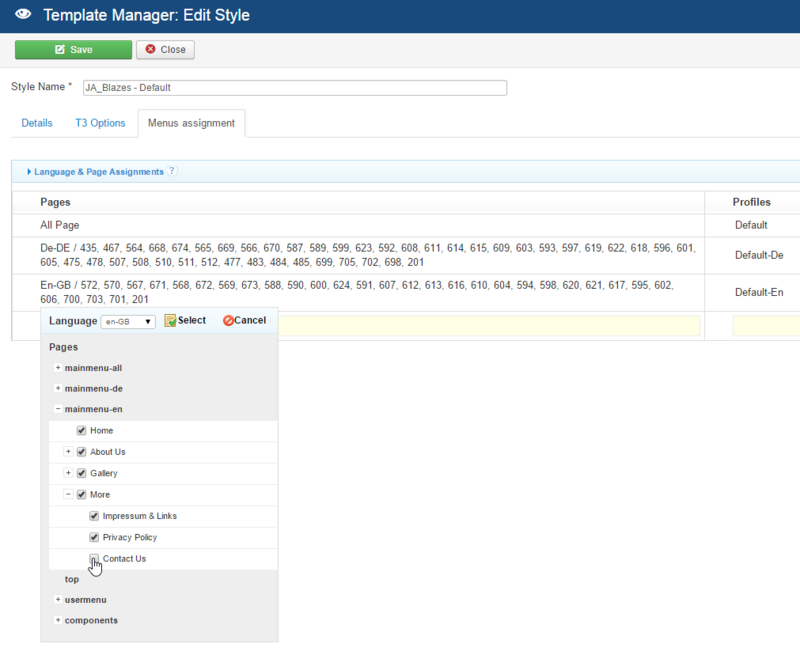 When you create new menu item, they will automatically be assigned to the default template unless you set is via menu item setting >>> assign via parameter Template Style. Maybe I’m doing something wrong? In that case, what do I need to change? 1. You must have 2 menus for 2 languages, each menu contain appropriate menu item for each language and set to that language only. well, yes. That’s what I did (at least I think so). As you can see in the last screenshot, there are 2 profiles created. Each one has its own menu assign to (one for german, one for englisch). To be sure, ask Saguaros, he has the login for my site. The problem is, as you might also see in the last screenshot, when I create a new menu item I have to go back to template manager and assign this newly created menu item also to the specific profile in menu assignment. What I would like to have (or at least to know if possible) is, that either in the menu assignment I can choose the whole menu so each newly created menu item is automatically included and the menu is shown on that new page; or any other possible way to do so. 2. Make sure that you have 2 template styles Ja Blazes – En and Ja Blazes – De, make Ja Blazes – En as default template so it will be displayed in all pages and set the Main Menu – En as default menu for this style. 3. Repeat the same process, set Main Menu – De to Ja Blazes – De then switch to tab Assignment, assign all current menu items of Main Menu – De to this style. 4. Next time, when you create new menu item in Main Menu – De, you can choose style Ja Blazes – De via Template Style option. This topic contains 6 replies, has 2 voices, and was last updated by Adam M 3 years, 10 months ago.